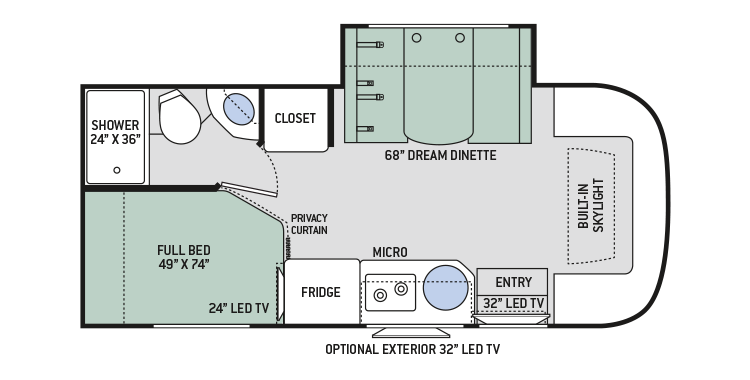 Class C Motorhomes are so great because they offer a lot of space with their design, are easy to drive, and affordable. Thor Motor Coach makes some of the best Class C Motorhomes on the road today. The Chateau Sprinter is built on the very reliable Mercedes-Benz® Sprinter Chassis making it an excellent choice for a small Class C Motorhome. It is loaded with standard equipment and tremendous options are available to compliment the standard features. The Power Patio Awning with Integrated LED Lighting makes the outdoors more enjoyable, while the Denver Mattress® Queen Size Bed will have you well rested. The Chateau Class C Motorhome by Thor Motor Coach is as they say "Made to Fit your pursuits." And with an abundance of floor plans and options, we know that to be true. As well features like residential vinyl flooring throughout and laminate kitchen countertops give it a real home away from home feel. 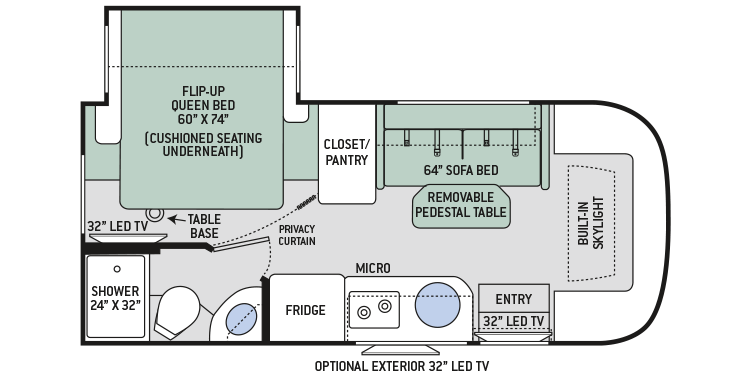 Floor plans that sleep up to eight people are available and will have you saying "the more, the merrier" on your next road voyage. This affordable Class C Mercedes-Benz® Sprinter is a breeze to drive and jam packed with great features and there are plenty of options available to make it distinctly your own. The 84" Interior Ceiling Height and Laminate Countertops will make you feel right at home while on your adventure. 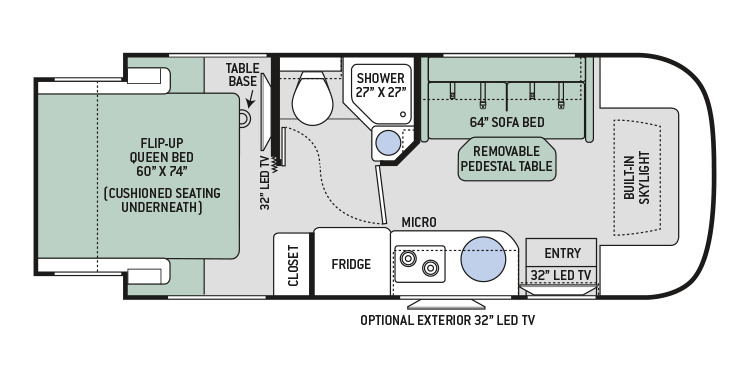 There are lots of lengths and options offered in a variety of floor plans with the Four Winds Class C Gas Motorhome by Thor Motor Coach. New this year is a redesigned Cab-Over Bunk that features storage compartments so you can bring more of what you want with you. 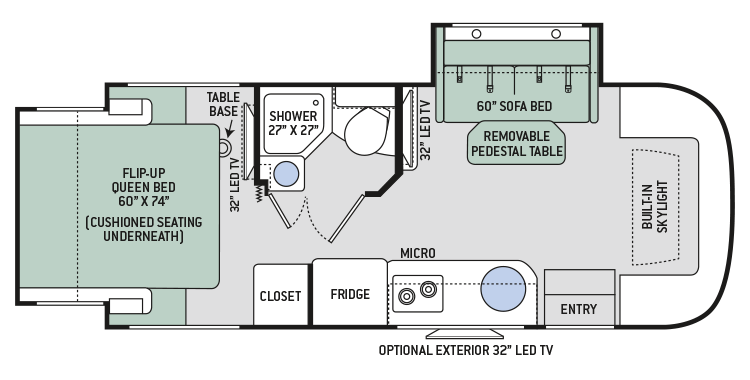 The 30D Bunkhouse floor plan offers sleeping for up to eight people. The Quantum series of Motorhomes by Thor Motor Coach is available at a price point that makes it accessible to first time RV buyers as well as attractive to budget conscious RV lifestylers. It comes in a variety of floor plans each with an abundance of options to complement standard features. The Siesta Sprinter is priced to fit anyone's budget and built to be a road warrior's home at any campsite. There is a European 2-Burner Gas Cooktop and Convection Microwave Oven, Leatherette Furniture, and Rotocast Storage Compartments with Side-Hinged Doors. And now the Exterior 32" LED TV on Swivel Bracket is standard. The Citation Sprinter is a compact diesel Class C Motorhome built to fit anyone's budget while not sacrificing great standard features and options. Being a diesel means better fuel economy and towing power. The Synergy Class C Diesel Sprinter has some great new features including Solid Surface Kitchen Countertop with Undermount Sink, a Lighted Step Wall, and Bluetooth® Coach Radio System w/DVD Player, HDMI Ready, App Control and Exterior Speakers, as well as an Exterior 32" LED TV on Swivel Bracket. The Heated/Remote exterior side mirrors and keyless entry system are invaluable features. This Recreational Utility Vehicle is easy on the budget as well as the eyes. Choose between a Ford® Transit RV Diesel Chassis or a Mercedes-Benz® Sprinter Diesel Chassis. And getting around is a breeze with the Rear View Mirror w/Back-Up Monitor. The Compass Diesel RUV is perfect for quick getaways that need a little extra power. There is plenty of storage, leatherette furniture, and a European 2-Burner Gas Cooktop and Convection Oven.